I've intended to learn Welsh since we moved here, but somehow didn't quite get round to getting started for the first few years. Then Brython, a friend of ours who Ian knows through the community bus service (he's a volunteer driver and committee member), started running a group for Welsh learners. Since he was willing to give his time, I felt it would be churlish not to go along. I didn't know Brython very well when the group started, a couple of years ago, but he was very pleased that I'd turned up, and was keen to encourage a new Welsh learner. He expressed this by looking straight at me for a lot of the evening, whilst talking Welsh. This was quite terrifying. Other members of the group were sympathetic and said things like, Don't worry, just listen out for the odd word that you know. The trouble was, I didn't know any words. After that evening, I had a choice: I could give up and run away, and either avoid Brython or feel awkward every time I saw him, or I could put some effort into learning a bit of Welsh before the next meeting a month later. As you may have guessed by now, I chose the latter option. There are lots of resources available online, as well as at the local library This is great if, like me, you're too skint to pay for actual lessons. Having got over the first hurdle - living smack bang in the middle of Wales, do I go for the North or the South version? (South, I think) - I quite enjoyed the BBC's Big Welsh Challenge*. After spending quite a bit of time with this over the following month, the next time I heard Brython speak Welsh, it sounded quite different - it sounded like language. This was an indication of quite how low my starting point had been. Unlike French or German, I'd had no prior exposure to Welsh at all, so my brain didn't interpret the sounds as language. We have specialist language-processing areas of our brains, so that language is treated differently from other sounds, and these just weren't engaging for me when I heard Welsh. No wonder I found it terrifying! That was almost two years ago, and since then I've continued to work away at learning Welsh. It's certainly not an easy language because it's very different from English. I found a very encouraging article on Quora that included the advice: It's not difficult to learn a language, it just takes a lot of time. As to how long, he gives the estimate of 600+ hours of study to reach fluency in French. Now, I think Welsh is rather more difficult than French, but on the other hand I'd be happy with something less than fluency, so I'll take 600 hours as a guideline figure. Suppose I were to study for 20 min a day, six days a week, for 50 weeks a year. That would be 100 hours a year, so 600 hours in six years. Twenty minutes a day feels doable, and I'd be very happy to have a reasonable grasp of the language in six years, especially bearing in mind that I took three years to even get started. For an English speaker, Welsh looks difficult. For a start, there are all those consonants - The villages of Ysbyty Cynfyn and Cwmystwyth are both a few miles from here . Then you learn that Y and W are vowels, most of the time, and it looks a lot easier. Then you notice the vowels: They're often strung together, just one after another with nothing to break them up. Lliwiau ( colours ), for example, has five of them in a row. Here I think it is essential to have a Welsh speaker to learn from, then it's just a matter of getting used to how it sounds when vowels are pronounced one after the other. The next big hurdle is mutations: The first letter of some words changes in some contexts. For example, the village I live in is called Pontarfynach, which is three words run together: Pont (bridge, same as French) ar (on) Fynach. The name of the river is Mynach (which means monk), so that M is mutated to F (which is pronounced like an English V unless there are two together) in the middle of the name. Then if I want to say that I live here, the P at the beginning mutates, too. It's all very confusing, but I've found that if I don't expect to learn the mutations as I go, then it's not that bad. In fact, I started with just trying to note, Oh yeah, that'll be a mutation, if I spotted one. My learners' dictionary has three pages of rules on the subject - there is no way I'm ever going to learn that lot. In fact, I'm pretty sure that native Welsh speakers do not learn the rules explicitly. For this reason, I'm aiming to expose myself to as much of the language as possible, in the hope that correctly mutated words become familiar and so feel more right than incorrect words. I'm focusing on reading, because unlike listening, I can go as slowly as I need to. This endeavour got a great boost when I discovered that the library has Roald Dahl books translated into Welsh and available in electronic format. Since we have a set of Roald Dahl books on the bookshelf, I can read the Welsh and English versions side by side. This way of studying is lots of fun, and the motivation to learn (rather than just checking the English all the time) is that I can read the story much more quickly if I can understand more of the Welsh. I'm not worried about getting every word, just enough to follow the story. The goal here is exposure, remember. In addition, I'm also listening to the radio, which is much harder to follow due to the speed. While I'm doing the dishes, it's usually Bore Cothi** that I'm listening to. Sian Cothi has such a warm smile in her voice that I feel welcome and included even if I don't understand a word. Increasingly, though, I do understand some of the words, and the regular structure of a radio show helps me, as I get to know what sort of thing is coming up next. Sorry for rambling on about it, but I'm quite excited to be making some progress with this. Last year, while I didn't feel like doing anything much, I did feel like learning Welsh. Having been fairly terrified to start with, and now I can more-or-less follow a book written for seven year-olds. I'm still too nervous to actually say much, though, so I'm going to start a beginners' conversation class next week. * I've also found Memrise very useful for learning vocab. The content is provided by users, so is a little hit and miss, but the way the material is presented and tested is based on very sound psychology. ** Bore means morning, so this is a play on Coffee Morning, which would be Bore Coffi . This is fantastic! I suspect I'll be attempting Dutch in a few years' time -- terrifying but yes, I'm telling myself, all I need is time. And a diligent routine. Slowly but surely, little and often. Sounds like it's working for you. Bravo! Give yourself a head start and start getting some familiarity with Dutch now! As you say, it really is a matter of time spent on it. Some of the stuff that I found almost impossible at the first attempt seemed quite easy only a few weeks later (I didn't attempt too much at a time). If I can do it, so can you! Also, do look at that article on Quora that I linked to - it's really good. Will do, Rachel! I visit a few Dutch websites and look at daily newspapers on line from time to time, but (so far) not "seriously". Planning to do a course next winter plus there's a Dutch woman in the nearest town who is a qualified Dutch/English teacher and offers one-to-one conversation sessions. I'll check out Quora. Thanks! Wow! Welsh sounds like a fascinating language, and those mutations sound... well, they sound challenging! At one point I tried to learn German, but I just couldn't get past all those case endings. Oy! Anyhow, I totally know what you mean about engaging the language processing part of the brain. When I was first living in Norway and learning Norwegian, I found that my ability to hear the sounds as language would come and go. It was especially difficult when I was tired, or when I was speaking with someone who had a difficult accent. One of the teachers in school was from the town of Bergen - which has a very different accent than the folks from Trondheim (where I was living.) I found him nearly impossible to understand. I don't know if you had the Muppet Show on TV there in Britain, but I was a big fan of it as a child, and there was one character called the Swedish Chef, who spoke silly nonsense that was supposed to sound like Swedish. Well, one day in class with the teacher from Bergen, I was tired and my brain just sorta went on revolt. Suddenly, everything the man said just started to sound like gobbledygook. He was kind of a wild-eyed fellow to begin with, and as I sat there not understanding a word of what was being said, he started to look and sound to me exactly like the Swedish Chef. I honestly did not mean to be disrespectful, but I couldn't help it, and I started to chuckle. Unfortunately, the lecture (which I hadn't understood a word of) was about the Nazi occupation of Norway during WWII, so it wasn't, ummm... the most appropriate time to get the giggles. I'm sure that didn't do much to improve their image of Americans, and I found it nearly impossible to explain what it was that I found to be so funny! BTW - churlish? skint? are these English words? I've never heard either one before! Apparently vocabulary is a life long pursuit even in one's native tongue! Oh, that story about the Swedish Chef is too funny! Yes, we do get the Muppet Show here, or at least we did when I was a child. How unfortunate to get the giggles in the middle of such a serious lecture! As for my English vocab, ah, hmm. 'Churlish' is a somewhat archaic word that I rather like. It means, roughly, ungenerous in a slightly sulky way (at least, in the manner of Humpty Dumpty, that's what it means when I use it). 'Skint' is slang, and quite possibly local to the area where I grew up. It means lacking money, though you probably figured that out from the context. I was in Wales once and was fascinated by the language. The only foreign language exposure I have had was German in high school. I found it easier to read it than it was to speak it or interpret what was spoken. "Churlish" is used in older books in the US--it is a fun word, isn't it? Reading Harry Potter taught me the word "skint"--I guess that tells you something about my reading preferences. 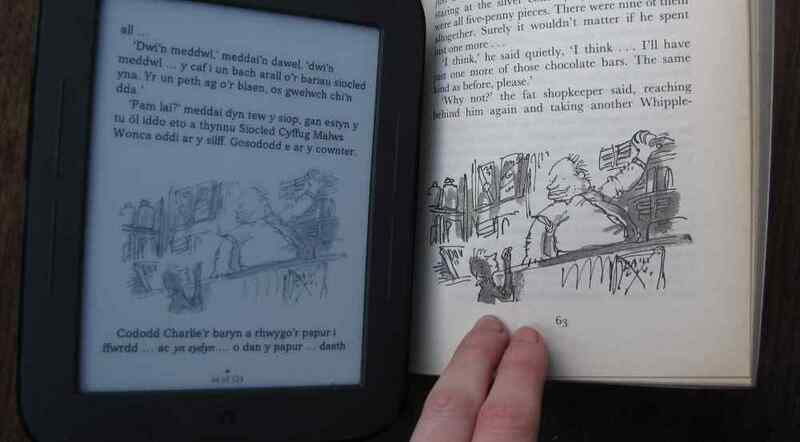 :) I am completely amused that you are reading Roald Dahl in Welsh. What a great way to familiarize yourself with the language! Hi Kris :-) So you are not a stranger to these shores, then! Welsh is a fascinating language, isn't it? So different from English. I'm glad to hear that "skint" is only UK-local slang, not Midlands-local, which I feared it might be, just then. For some reason I've never got into Harry Potter - I'm not sure why. Maybe I'll read them when someone's translated them into Welsh! At the moment I'm reading the BFG - CMM - in Welsh, which is extra challenging, as the BFG uses some creative language, so I'm not sure whether I'm reading genuine Welsh or the equivalent of "scrumtilicious" or somesuch. Possibly not the best choice, but I'll persevere. I've only read bits and pieces of Roald Dahl--my husband thinks they are funny so he's done most of the reading with the kids for that author. It would be fun to see how he translates words that aren't really words at all in English. I am certainly not a world traveler! My best friend and I spent 2 weeks in the UK about 20 years ago. 10 days were with a tour, where we skimmed the very edge of Wales (enough to say "We've been to Wales!"). We took a few extra days to do whatever we wanted, and on one of those days we took a train from London to Cardiff. We saw the castle there and went to see Castell Coch--it's been so long, I don't even remember how we got to that castle--train? Taxi? We really enjoyed our time there and found all the locals to be friendly and enthusiastic about their country. Someday I'd love to go back and explore it further. I've always been fascinated by words and language and I think it's great that you get the opportunity to learn Welsh. I love HP--the first 3 books are more "kid" in their content, but by the fourth book, the storyline takes on more depth. It isn't for everyone, though. Great post. I've been a bit fascinated by Welsh and Gaelic and it is interesting to hear about your learning. Thanks. I'm finding the language fascinating, too, now I've got over my initial terror. It's very different from English. It seems to me that the unit of meaning is larger than one word in many cases. That is to say, you need a phrase or sentence to be sure what each word means. The dictionary tends to give several translations for a word (not all of them, but many), e.g. brig - top, summit; outcrop; twig. You then need the context to know which meaning is appropriate. I think this makes Welsh a more poetic language than English. I love the idea of being able to speak (or at least get by in) another language..this has never translated into me actually doing anything about learning- so I admire you for actually getting to grips with Welsh! I had a friend at uni who spoke Welsh (I think she had been taught it at school rather than learning from her family) and she taught me a few words...none of which I can remember now! I once read a book of advice on doing a PhD, and it started with, "Do you really want to do a PhD? Not do you want to be a doctor, but do you want to go through the process of getting to that point?" I think this is an excellent question for anything that involves a lot of work: Do you actually want to do the work, or do you just want the end result? Do you want to learn a language, or do you just want to be able to speak it? If you don't want to do the learning, then don't! Luckily, I'm enjoying the learning, at least at the moment, so I shall carry on.